I always knew I liked a beer with my pizza but I never thought about putting it IN pizza, until now. This beer pizza dough recipe makes a yeasty, tender, chewy, crunchy, perfect crust. Best of all, you can use any flour mixture that you want. White flour, whole wheat, or a mixture of several flours, it’s up to you. I do suggest that you add about 1/3 cup gluten if you use whole wheat flour. This will give the dough stretch. You can leave the first mixture out for longer if you need to. The flavor will intensify the longer it is out (within reason… a month is way too long). I like using a dark lager in the dough… I think it gives it a better flavor. Use what you have, though. I made mine with Shiner Dark Lager, one of my favorites. One thing I noticed with this is that the dough bubbled up soon after kneading. The baked dough had a lot of air bubbles in it, too. I like that characteristic in my pizza. Add beer to a pizza dough recipe and you have a flavorful, perfect crust every time. Roll it thin for a crisp crust, let it rise for a thick one. Mix the beer and the yeast and 1 cup of the flour. Let stand for 2 to 4 hours. Add the rest of the flour and the salt and knead until very elastic. Allow to rise for about an hour. Punch down and form into two rounds. Let rest for about 10 minutes. Roll out the thickness you want and fit into pizza pans sprinkled with cornmeal. Rub with olive oil and bake in a 500F oven for 5 minutes. Add sauce and cheese and preferred toppings. Return to oven and bake until done; about five more minutes. Nutrition information is based on one crust. Just divide calories by the number of slices the pizza is divided in to. I made a batch this evening; it was fabulous! Thanks, Marye. awesome! so glad Lee Ann. The crust looks absolutely PERFECT!!! So tender yet wonderfully chewy. Mmm. 🙂 Well done! 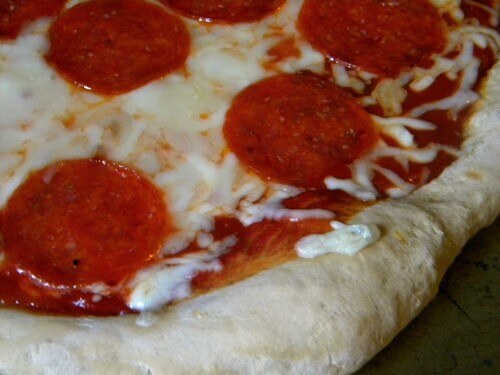 I am trying to come up with the perfect pizza dough recipe. I don’t know why I’ve never considered adding beer to the mix. I can’t wait to try this!